Description: The body and ceratal surfaces are pigmented with white and brown-red patches and there are yellow bands towards the tips of the cerata. 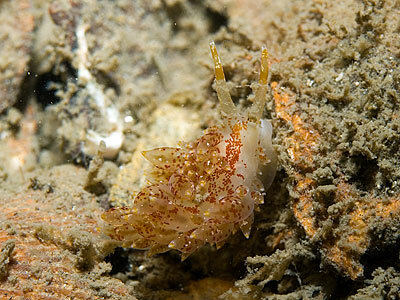 The rhinophores and oral tentacles have a band of brown pigment and white pigment spots becoming dense at the tips. Alder & Hancock had a very pale individual as their type specimen, hence the somewhat inappropriate specific name; they later wanted to change the name to picta (painted)! Adults may reach 23mm in length. Habitat: The adults may feed on the hydroid Tubularia, however juveniles usually take smaller calyptoblastic hydroids such as Obelia dichotoma, which often grows on Tubularia, and Halecium species. Distribution: It is distributed all round the British Isles, America, Iceland and From Norway to the Mediterranean. Brown and yellow-white pigment spots on body and cerata. Picton, B.E. & Morrow, C.C. (2016). 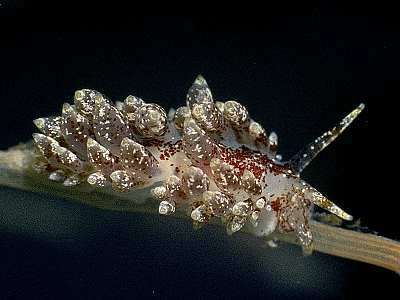 Eubranchus pallidus (Alder & Hancock, 1842). [In] Encyclopedia of Marine Life of Britain and Ireland.